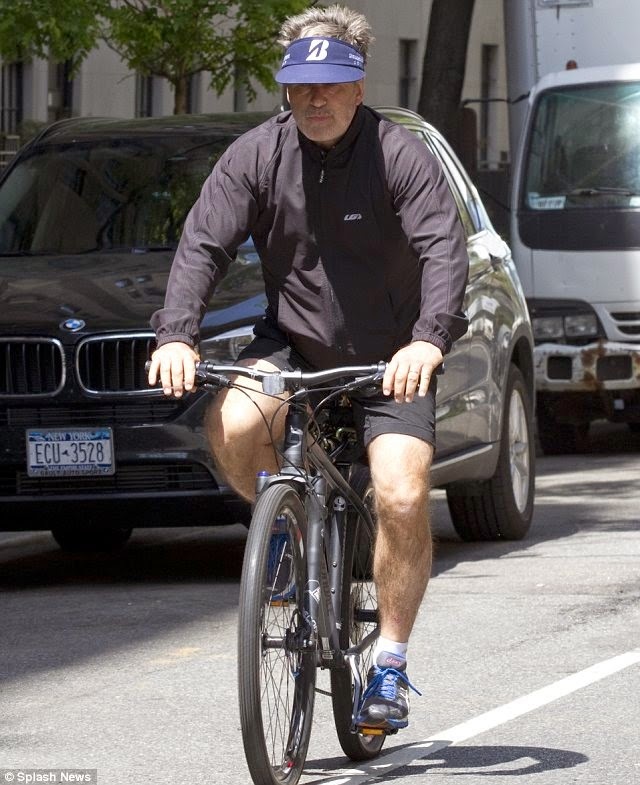 Alec Baldwin was detained in New York on Tuesday for riding his bike the wrong way down Fifth Avenue. The volatile actor was handcuffed by police officers and taken away in a squad car, with one witness telling In Touch he 'went ballistic on the cops, screaming at them' during the incident which led to his arrest. 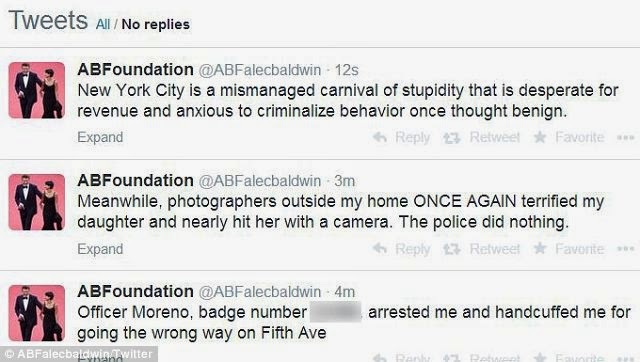 The New York Police Department confirmed to MailOnline that Baldwin was stopped at 10.15am at the corner of 16th Street. He was asked to provide ID which he didn't have on him. Officers said that he then started to argue with them and was taken into custody. 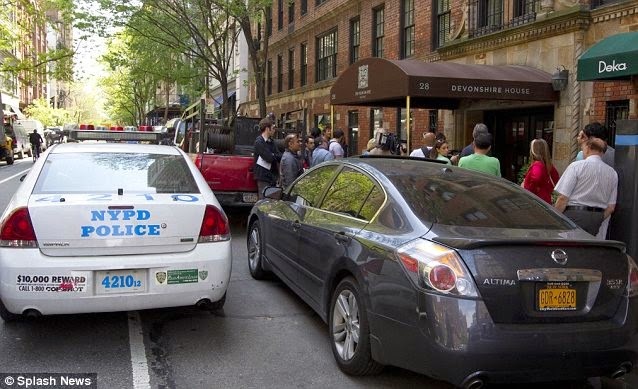 Baldwin was taken to 13th Precinct where he was identified and given two summons – one traffic violation for riding the wrong way and a second for disorderly conduct. A source told the New York Daily News he became enraged because the young police officers failed to recognize him. 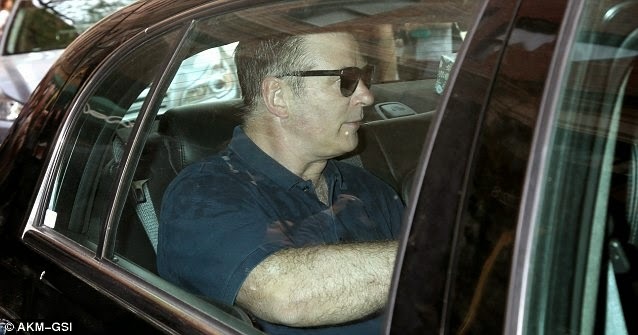 He has been released and arrived home at his New York apartment at 12.20pm. The 30 Rock star looked angry and did not reply to request for comment from media gathered outside. MailOnline has contacted the NYPD about this tweet but they have so far refused to comment on the officer. His wife Hilaria arrived home with their nine-month-old daughter Carmen just before him and shouted at the assembled press. Video obtained by MailOnline appears to show her greeting him in the lobby of their East Village building. Although Alec argued with officers, by the time he was cuffed he was 'calm and quiet', an onlooker told In Touch. Eddie Cacho, a hairdresser at Dramatics NYC Salon, saw the commotion going on outside by the parking meter. He told MailOnline today that he saw an older gentleman handcuffed and still sitting on his bike. Mr Cacho said the man, later identified as Baldwin, seemed sombre, was not animated and was not resisting arrest. He was in handcuffs on his bike for around ten minutes. A man who identified himself only as Kim, who works at the flower stall attached to Regale Deli, said he saw the man looking angry and animated before his arrest. He said the whole thing took 20 minutes from start to finish. By the end, two additional NYPD cars had turned up as back-up. Drew Exis, who works for the city managing traffic flow, took notice when he saw the extra police cars arrive. He saw a man being cuffed and have his head being put down as he was put in the back of the car and driven down Fifth Avenue. Baldwin was alone at the time of the arrest and is reported to have been cycling for exercise.